In 2000, we set out on an uncharted journey. Neither did we have any strategy nor any idea about how far we could go. I still remember the day when we took the first meal to a government school. The children loved it. I did not believe that we would go with food the next day as well, but we did, and now we have been doing this for seventeen years. 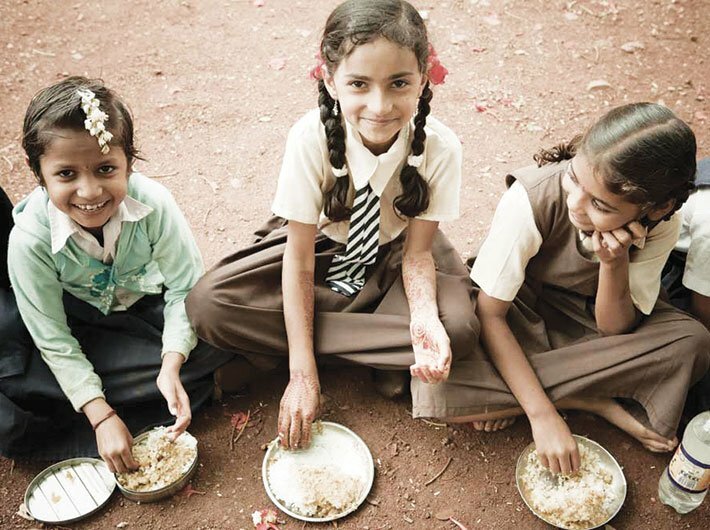 The Akshaya Patra Foundation was our first foray into establishing an organisation that would specifically work for the underserved children in India; for whom, hunger is an impediment to education. I clearly remember it was a Sunday. Mohandas Pai and Abhay Jain had come to the ISKCON Bengaluru temple. Mr Pai was urging if we could do something for the children in government schools. We thought: we are anyway feeding people (Annadanam) who visit the temple, so why not specifically feed underprivileged school children. This would not only feed children in need but also boost education levels within communities by ensuring higher levels of retention. We were undecided when we ended the meeting. We met again the following Sunday. We talked about using the underutilised temple kitchens. Mohan wanted to donate a vehicle to transport cooked food to the schools. Abhay promised that he would get more donors to contribute for vehicles. By the end of the meeting, we concluded that we shall address classroom hunger for underserved children in government and government-aided schools, using under-utilised facilities of the temple. Our objective was to ensure that ‘no child in India shall be deprived of education because of hunger’. With this solemn thought in mind, we started our pilot project by serving mid-day meals to 1,500 children across five government schools in Bengaluru. In due time the word spread that “free and delicious food” is being served and that was when other schools started approaching us. Within six months, we had requests for [providing food to] one lakh school children. Witnessing this overwhelming response, we set ourselves on a challenging goal of feeding one million children within 10 years and we knew that this would translate into reality only if the society as a whole use some of its resources and extend its support to the cause. The unflinching support of the government, along with collaborations and support from philanthropic organisations, corporates and conscientious individuals have really helped us scale our feeding programme pan-India. Today we reach out to 16,10,396 children in 27 locations across 11 states of India. We have a passionate team of trustees and advisors, a committed and preserving team of missionaries, and a highly competent and motivated team of employees that make up the Akshaya Patra family. From the first mile we travelled to where we are today, we have faced a myriad of challenges. As we grew, so did our need for technology, resources, manpower and an ability to understand and work with our stakeholders. But we did not get overwhelmed by these challenges. We worked together with enthusiasm and efficiency to grapple with them because we could see that our meals were making a difference to the lives of the children. Whether it was sourcing a roti-making machine to churn out 60,000 rotis or cauldrons to cook large quantities of dal or rice, we spent hours putting our energies together. We became inventors as most of the technology that we use in our kitchens is indigenously designed. Moreover, our team works closely with industry experts to innovate, adapt and perfect kitchen operations to ensure safe and hygienic meals to all our beneficiaries across the country. There is no doubt that along the way we have made mistakes, but each mistake has just made us stronger and richer in experience. We have learnt to embrace risks and sustain our feeding programme amid evolving beneficiary needs. The role of the government and the state governments has proved seminal to the success of the foundation. By entering into a public-private partnership with the government, we have been able to expand our reach and services across the country. This partnership has given Akshaya Patra a major boost in translating its vision. The partnership has ensured timely allocation of grains and [meeting] conversion costs along with grants and subsidies. It has eased the process of seeking donations in India and overseas. Additionally Akshaya Patra has also adopted a large number of best practices that have helped us in reaching quality meals to our beneficiaries every school day. Corporates too played a pivotal role in the implementation of our school meal programme. Since we are a not-for-profit organisation, we are in constant need of funds to smoothly run our programme, expand our reach, enhance our services, balance out costs and meet miscellaneous expenses required for the upkeep of the school meal programme. With corporate social responsibility (CSR) becoming mandatory for companies, Akshaya Patra has received donations, both in cash and in kind from the corporates. Matters of capital cost and recurring costs have been taken care of and we have been able to sustain our mid-day meal programme in all the states that we operate in. We have galvanised strategic partnerships with corporates for acquiring and upgrading physical assets required for setting up new kitchens, food distribution vehicles and procurement of lab equipment, and for its ‘Go Green’ initiatives like biogas plants, effluent treatment plants, and solar kitchens. Corporates have also given us pro bono consulting services. These partnerships have facilitated Akshaya Patra to maintain and amplify the scope of its operations. While we aim at transforming more lives, we feel the need to continuously progress in all spheres of implementing the mid-day meal programme. Since we deal with perishable commodities, it is imperative to continuously strive and maintain world-class quality standards so that our beneficiaries get nutritious food. To tackle this challenge, we ensure quality till the last mile. We follow a carefully prescribed food safety plan whilst handling, preparing and storing food, to make sure that no child falls ill owing to foodborne illnesses. Our kitchens practise ‘5s’ – sort, set in order, shine, standardise and sustain – and are GMP – good manufacturing processes – compliant, checked with regular audits. The quality of raw materials is ensured by supplier quality management programmes [SQMS]. Only when the raw materials meet the FSSAI [Food Safety and Standards Authority of India] specifications, they are approved. It is ensured that all of Akshaya Patra’s cooking equipment meet with appropriate standards of food safety. All equipment – cauldrons, trolleys, rice chutes, dal/sambar tanks, cutting boards, knives etc. – are put through a process of steam sterilisation before being used for cooking. The foundation also organises regular training sessions to educate the staff on different types of hazards, food poisoning and GMP. Training in HACCP [hazard analysis and critical control point], control measures like temperature checks, and emphasis on the importance of communication in food safety are also stressed upon. Monthly audits, quality metrics performance reviews, detailed customer satisfaction surveys and other such measures are also regularly implemented. Even with all these measures in place, Akshaya Patra believes that there is always room for improvement. Therefore, improvement strategies like Kaizen, continual improvement projects and ‘Six Sigma’ are constantly being implemented in our kitchens across the country to ensure food safety and efficiency at all times. We constantly strive towards improving the service levels for our beneficiaries. We have taken certain measures to ensure timely delivery of food in all our 13,529 beneficiary schools. We have opted for route optimisation by using tools developed by Indian Institute of Management Bangalore (IIMB) professors and graduates. We have also initiated technology interventions in the logistics operations. We have installed vehicle tracking systems using GPS technology in the vehicles. This has brought control, transparency and assurance in tracking delivery of the meals to schools. Today, as we move steadily towards achieving our aspirational goal of ‘feeding 5 million children by 2020’, we can see the path ahead more clearly than we did in the beginning, Our resolve is stronger and so is our capacity; thanks to the constant support and patronage that we have received from the government of India, the state governments, corporates, donors and to the community around. We owe it them for believing in our ability to deliver effectively in eliminating classroom hunger from India. Dasa is chairman, The Akshaya Patra Foundation.